Sepehri Moghaddam, H., Emadi, M. (2014). The Effect of Threonine and Vitamin A on Immune System in Broiler Chickens. 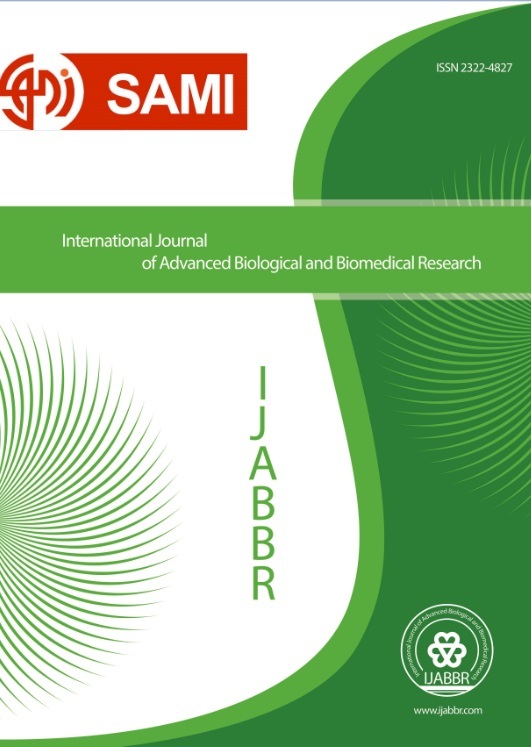 International Journal of Advanced Biological and Biomedical Research, 2(3), 756-763. Heshmat Sepehri Moghaddam; Mozhdeh Emadi. "The Effect of Threonine and Vitamin A on Immune System in Broiler Chickens". International Journal of Advanced Biological and Biomedical Research, 2, 3, 2014, 756-763. Sepehri Moghaddam, H., Emadi, M. (2014). 'The Effect of Threonine and Vitamin A on Immune System in Broiler Chickens', International Journal of Advanced Biological and Biomedical Research, 2(3), pp. 756-763. Sepehri Moghaddam, H., Emadi, M. The Effect of Threonine and Vitamin A on Immune System in Broiler Chickens. International Journal of Advanced Biological and Biomedical Research, 2014; 2(3): 756-763. Aslam SM, Garlich JD, Qureshi MA (1998). Vitamin D deficiency alters the immune response of broiler chicks. Poult.Sci. 77: 842-849. Bhargava K, Hanson RP, Sunde L (1971). Effects of threonine on growth and antibody production in chicks infected with live or killed Newcastle disease virus. Poult.Sci. 50: 710-713. Boa-Amponsem K, Picard M, Blair ME, Meldrum B, Siegel P (2006). Memory antibody responses of broiler and leghorn chickens as influenced by dietary vitamin E and rout of red blood cell administration. Poult.Sci. 85: 173-177. Corrier DE, DeLoach JR (1990). Evaluation of cell-mediated cutaneous basophil hypersensitivity in young chickens by an interdigital skin test. Poult.Sci. 69: 403-408. Cuaron JA, Chapple RP, Easter RA (1984). Effect of lysine and threonine supplementation of sorghum gestation diets on nitrogen balance and plasma constituents in first-litter gilts. J.Anim.Sci. 58: 631-637. Da Silva ICM, Ribeiro AML, Canal CW, Trevizan B, Macagnan M, Goncalves TA, Hlavac N, De Almeide L, Pereira R (2010). The impact of organic and inorganic selenium on the immune system of growing broilers submitted to immune stimulation and heat stress. Braz.J.Poult.Sci. 12: 247-254. Duncan DB (1995). Multiple range and multiple F tests. Biomet. 11: 1-42. Kidd MT, Ferket PR, Garlich JD (1997). Nutritional and asmoregulatory functions of betaine. World.Poult.Sci.J. 53: 125-139. 1997. Kidd MT (2000). Nutritional consideration concerning threonine in broilers. World.Poult.Sci.J. 56: 139-151. Kidd MT (2004). Nutritional modulation of immune function in broilers. Poult.Sci. 83: 650-657. Kogut MH (2009). Impact of nutrition on the innate immune response to infection in poultry. J.Appl.Poult.Res. 18: 111-124. Leeson S (2006). Defining and predicting changes in nutrient requirements. XII European Poultry Conference, Verona, Italy, September 10-14. Lessard M, Hutchings D, Cave NA (1997). Cell-mediated and humoral immune responses in broiler chickens maintained on diets containing different levels of vitamin A. Poult.Sci. 76: 1368–1378. Li P, Yin Y, Li D, Kim SW, Wu G (2007). Amino acids and immune function. B.J.Nut. 98: 237-252. Livingston KA, Klasing KC (2011). Retinyl palmitate does not have an adjuvant effect on the antibody response of chicks to keyhole limpet hemocyanin regardless of vitamin A status. Poult.Sci. 5: 965-970. Maggini S, Wintergerst ES, Beveridge S, Hornig DH (2007). Selected vitamins and trace elements support immune function by strengthening epithelial barriers and cellular and humoral immune responses. B.J.Nut. 1: 29-35. NRC. Nutrient Requirements of poultry (1994). National Academy Press. 9th ed. Washington DC, USA. Peng LI, Burr G, Gatlin D, Hume M, Patnaik S, Castile F, Lawrence A (2007). Dietary supplementation of short-chain fructooligosaccharides influences gasTrointestinal microbiota composition and immunity characteristics of pacific white shrimp, litopenaeusvannamei, cultured in a recirculating system. J.Nut.137: 2763-2768. Ritchie BW, Harrison JG, Harrison RL (1994). Avain medicine. Winger's Publishing, Florida, pp. 176-198. Ross Broiler Nutrition Specification (2007). J-aviagen web. http://www.aviagen.com/. Accessed Feb. 2013. SAS. Statistical Analysis Systems userʼs guide (1985). SAS Institute Inc. Raleigh. 5th ed. North Carolina, USA. Schaart MW, Schierbeek H, Van Der Schoor SR, Stoll B, Burrin DG, Reeds P, Van Goudoever JB (2005). Threonine utilization is high in the intestine of piglets. J.Nut. 135: 765 770. Semba R.D (1994). Vitamin A, immunity and infection. Clin.Infect.Dis. 19: 489-499. Sepehri Moghaddam H, Nassiri H, Kermanshahi H, Heravi A, Raji A (2011). The effect of threonine on mucin2 gene expression, intestinal histology and performance of broiler chicken. Ital.J.Anim.Sci. 10: 66-71. Silva D, Della Torre da Silva J, Torres KAA, de Faria Filho DE, Hirota Hada F, Barbosa de Moraes V.M (2009). Humoral immune response of broilers fed diets containing yeast extract and prebiotics in the prestarter phase and raised at different temperatures.J.Appl.Poult.Res. 18: 530–540. Sklan D, Melamed D, Friedman A (1994). The effect of varying levels of dietary vitamin A on immune response in the chick. Poult.Sci. 73: 843–847. Takahashi K, Konashi S, Akiba Y (1994). Effects of dietary threonine level on antibodyproduction in growing broilers. Anim.Sci.J. 65: 956-960. Villamor E, Fawzi W (2005). Effects of Vitamin A supplementation on immune responses and correlation with clinical outcomes. Clin.Micro.Rev. 446-464. Wang X, Qiao SY, Liu M, Ma YX (2006). Effects of graded levels of true ileal digestible threonine on performance, serum parameters and immune function of 10-25 kg pigs. Anim.feed.Sci.Tech. 129: 264-278. Wu G, Flynn NE, Flynn SP, Jolly CA, Davis PK (1999). Dietary protein or arginine deficiency impairs constitutive and inducible nitric oxide synthesis by young rats. J.N.129: 1347-1354.